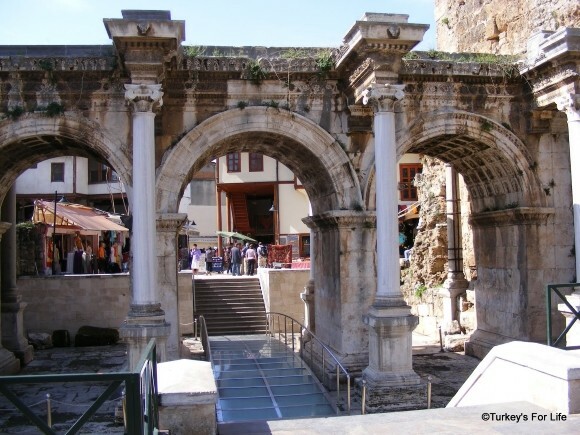 This article about Kaleiçi (Antalya old town) was originally written in 2011. We’re a few years further along the line now and things change. As we’re in Antalya on at least an annual basis, we thought it was time for a little update of the original article. A celebration of Kaleiçi, Antalya – that little area of the city where we love to spend so much of our time. In the early 2000s, Antalya was Turkey’s fastest growing city (unsurprisingly, it was usurped by the sprawling metropolis of Istanbul) and the multitude of high rise apartment blocks on the outskirts of the city are evidence of this speedy growth. However, in the centre of Antalya, it’s a different story and new development and restoration of historic buildings is carefully controlled. For us, central Antalya feels more like a town rather than a large city. 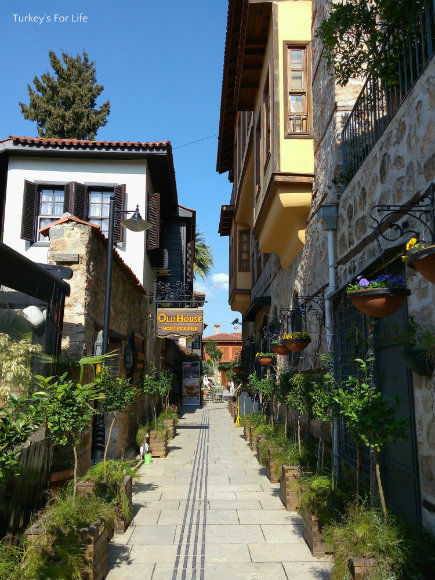 But, there is one area in the centre where it is very easy to lose yourself; Kaleiçi (meaning ‘within the city walls’). Enter the world inside these ancient walls via Hadrian’s Gate, the harbour, the paths leading from the clock tower. Antalya’s old quarter isn’t huge but it is big enough to wander around, realising you’ve come full circle while thinking you were heading straight on. It’s only recently that restoration in Kaleiçi has taken place and much has changed since even the early 2000s. The belediye (council) have now seen fit to put street names and numbers at junctions. Small area maps indicate ‘You are here.’ And yet, still, we are constantly lost when we are wandering these narrow cobbled streets. It’s not a problem, getting lost in Kaleiçi. If you’ve got time on your hands and you’re going nowhere in particular, it’s actually really pleasant strolling along the walkways; each side guarded by Ottoman-era dwellings. Some are beautifully restored to their former glory whilst others wait patiently for their turn. Their new lease of life. Some of the buildings are private homes whilst others have been converted into boutique hotels with central courtyards. There are smaller hotels like Dantel Pension for people like us who travel on a budget. And, as you might expect, there’s a plethora of souvenir shops and bars and restaurants to suit all tastes and budgets. Many of our favourite places to eat and drink in Antalya are in the Kaleiçi area. Antalya’s large university campuses attract students from all over Turkey and Kaleiçi is the area where many of them like to descend in their spare time. S o there’s a lovely young vibe in a historic part of the city. Live music venues, pubs, chill out bars and coffee shops. We love it! Restoration is ongoing in Kaleiçi. Don’t be surprised to turn a corner and see semi-demolished buildings. Sadly, some with wooden frames became unsafe. The beautiful konak in this photo is somewhere we visit every year in the hope that something has been decided about its future. What is the fate of this precious dwelling? The first time we were in Antalya back in the early 2000s, we were invited inside and shown around. It was rickety even then; sloping landings and creaky floorboards. Some of the carpets were still down and ornate woodwork prevailed. So many clues of what once was. The history was alive and it was sad to see what this once grand home had become. The guy showing us around explained the difficulties with buildings like this; owned by families and passed down through generations. Sometimes, these younger generations who have inherited properties might not even live in Turkey anymore, let alone Antalya. So, for now at least, the entrance to this particular piece of history is firmly sealed. We hope, one day, someone will be able to put some love back into it. Anyway, back to our wanderings around Antalya’s old town. Wandering around aimlessly is all well and good when you’ve got no particular plans. But what happens when you could really do with getting your bearings because you’ve got to meet up with friends. Ahh, that’s where GPS comes in very handy. Should your phone battery let you down, however, one of Kaleiçi’s most famous landmarks is the Kesik Minaret (Broken Minaret). When we’ve been taking part in Runatolia, friends have been staying in different hotels around Kaleiçi. The centrality and prominence of the Kesik Minaret has been more than useful in ensuring we all manage to meet up. And the great news with Kesik Minaret and the ruins around it is that they, too, are now undergoing excavation and restoration work. These ruins have been a temple, a Byzantine church, the Korkut Mosque (hence the minaret) and, of course, our meeting point. In the future, we might be able to finally get inside to mooch around this place, too. Our trips to Antalya often mean taking ourself for little outings around the area. Jumping on the tram or bus to places like the ruins of Perge or Terra City to pick up our Runatolia chips and bibs – and watch the high heels race. Or we might just take a walk along the coast to Konyaaltı or wander out of the old town and into Karaalioğlu Park. That means the ever changing Kaleiçi still has lots of surprise treats in store for us. Take this small park and viewing area, for example. We don’t mind admitting that is was 2017 before we happened across this little park created two years previously. Had we never walked down this street before? Clearly not. Anyway, water feature, sculptures and a small crowd of people hovering at the far end tempted us to go and explore further. We soon found out what the small crowd were up to. How brave are you with glass floor viewing areas? There we were, faced with a view of Mermerli Beach – straight down below us, with only a piece of glass between us and a huge plunge! A tad unnerving but fun, too. If more solid ground is your thing, this little park area also offers fabulous views over the old harbour; fishing boats and day trip boats coming and going, plying the route to Düden Waterfalls. As with everything else in this area, all of this has had a spruce up to. It’s now a lovely walk from Kaleiçi down to the harbour – and with no hefty climb back to the top. You can now use the glass lift. And what’s this? Another happy surprise discovery on our last visit to Kaleiçi. So many layers of history to this place and we had no idea there was a Greek church in the area – a functioning one at that. Just a walk, a glance sideways and this completely unexpected view of the interior of Hagios Alypios Church. More exploration of this to be done on our next visit! On this particular day, a Turkish couple were being guided around and it just looked like a scene we didn’t want to disturb. Now, if you’re reading this and thinking, “Why don’t they just do some research before they go then they know where to find all these Kaleiçi treats,” well, we do research lots of places. But we also love slow travel and just being somewhere. We love to just be in Kaleiçi and, slowly slowly, with each visit, we’ll happen across fascinating places we’ve never previously noticed. We’ll happen across brand new bars or attractions. And we’ll return once more to our favourite watering holes. 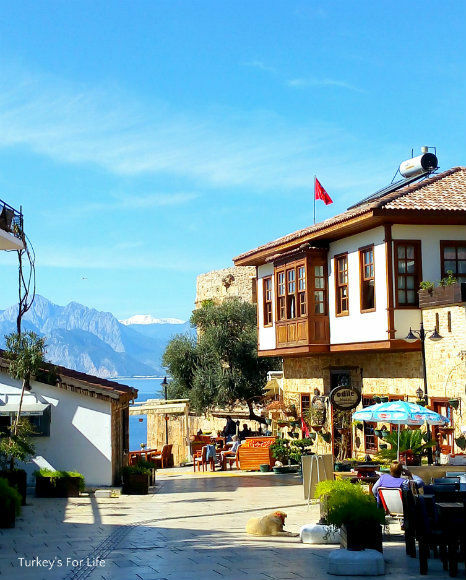 Getting happily lost in Antalya’s Kaleiçi is a comorting mix of the familiar and the new. Find yourself a cafe or bar (we usually opt for the latter) where you can see out onto the street. While sipping your chosen beverage, indulge in a spot of people watching and see how many people stop with confused looks on their faces. This is usually followed by the people pointing in opposite directions and sometimes, even a little bit of tetchy discussion about which route to take. Wandering around is one of my favorite past-times! You never know what you’ll discover! @ Joy: Us too. Nice to take off somewhere with no particular aim in mind. 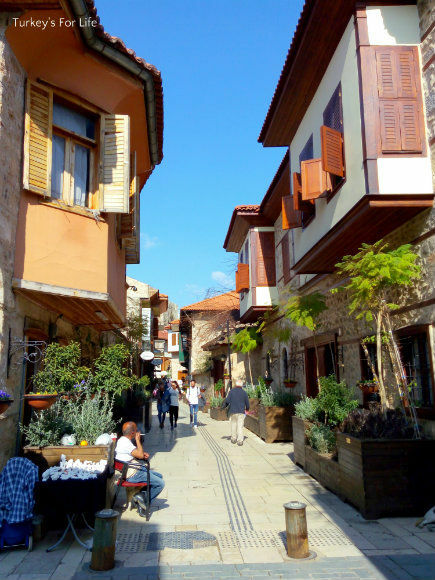 Very nice post – I also have a soft spot for wandering around old towns. I guess Kaleiçi is another one I have to put on my list to visit someday. Haven’t been there since 1993. Looks like it’s been restored a lot. The things I remember most are sheltering under Hadrian’s gate in a torrential thunderstorm; staying in a wonderful newly restored pansyon, the Atelya; eating great kebabs in a street with a very long name at the top of Kaleici. I didn’t realize there was such growth there. Gorgeous photos – wandering is definitely my favorite way to exploring. I visited Antalya with my family when I was about 14 and so I don’t remember much; we also went to Mersine and the beach (that I remember); the photos of that district are enchanting and I could definitely spend a few days wandering happily in Antalya. @ Cathy: It’s really pretty. You get a really good idea of how people used to live in Antalya. @ Tony: Yeah, a lot’s changed since we were last there 4 years ago so I bet you wouldn’t recognise it if you were there so long ago. @ Belinda: Thanks. Yeah, we love to wander around aimlessly. @ tasteofbeirut: The beaches are really long and backed by steep cliff faces. Gorgeous. I’ve been twice in this charming city and I love three things about Antalya – its amazing resorts, opportunity to fly a hot air balloon and astounding picturesque Old Town. I look forward to visit it for the third time! @ Travel Geek: This visit was our second time, too. It’s really convenient for us to get to so we’ll definitely be back soon. Kaleici is a real hidden gem. Since we first fell across it, we’ve stayed there every year. We love to just turn up with no accommodation booked and wander around asking to see the rooms and striking a deal on the room rate. We’ve found some really lovely boutique hotels and pansiyons that way. I love how you can go shopping in the city centre then escape back into quiet little Kaleici. I wish they’d completely ban cars though – maybe use golf carts from the car park to transport luggage. I always encourage people who think Lara Beach is all there is to Antalya, to try exploring. But then again, we don’t want everyone discovering our little secret do we? Love this article about Kaleici. The last 2 times we were there in 2018 we found Velespit cafe. Crochet on the trees, really colourful. The food is lovely and reasonably priced. We stayed at the Dante’s Pansyon last time, the Velespit is just around the corner. Opposite the cafe is an amazing Fish n Raki restaurant not to be missed! !